Hollywood Park was opened on Saturday 3rd June 1884 by Mrs John McClure, the Mayor and members of the corporation. A brass band played selections of music and members of the Lads Club gave a gymnastic exhibition. 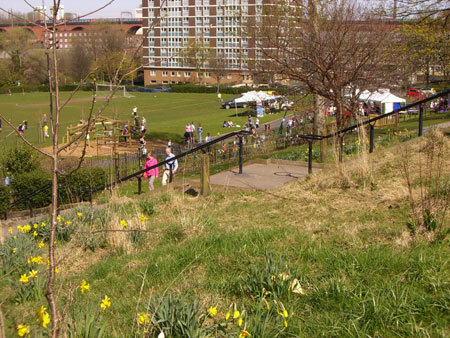 Mr John McClure did not live to see the opening of the park, which he saw as a great benefit for the people of Edgeley. The park has undergone a drastic transformation in the last few years. The views from the elevated section of the park of the railway viaduct and industrial Stockport are more impressive than it may sound.